This page has a few Art Deco and Craftsman Style outdoor and porch light options. Arts and Crafts Outdoor collections with charming mission-inspired details perfect for your Prairie Style home. Outdoor lighting fits in with Art Nouveau style. Contemporary outdoor lighting collections bring clean styling to your outdoor wet location. Enhance the exterior of your home with these unique contemporary designs. Architecturally harmonious forms combine with LEDs for effective outdoor lighting. Energy-efficient LEDs meet high style for architectural interest and illumination. Minimalistic and cleverly contemporary options. Not your typical outdoor lighting, these unique choices say a lot about you and your taste. Efficent lighting with unique styling and lots of options. Linear minimalist designs for the ultimate in urban sophistication. These stunning, modern outdoor collections have robust construction and clean lines. Inspired by the nautical lanterns sailors used, these outdoor lights have the appearance of oil lamps with the quality to stand up to a variety of settings. Onion lights are available in a variety of painted and metal finishes, including natural copper. From traditional favorites to contemporary updates of these marine designs. Bulkheads are versatile durable lights used in industrial or marine environments. They can be used on walls or ceilings. Architects and designers use these to indoors and outdoors to coordinate with a nautical inspired interior or to add a fun feel. Outdoor lighting for your lodge or cabin. Or just add that rustic log home feeling to any home. The pine cones and pineneedles of Avalanch Ranch and Kalco Collections are classic. Avalanche Ranch's Trout Outdoor Collection is perfect for your lake house. Kichler's Hatteras Bay Collection, inspired by classic industrial lighting coordinate with rustic, urban or coastal interiors. On trend and welcoming, farmhouse style outdoor lights bring a relaxed charm to any home. These subtly rustic porch and outdoor lights come in galvanized finish and a variety of distressed or painted finishes. Pineapples, the traditional symbol of hospitality are beautifully realized in the Hinkley Plantation Collections. The historical design of Quoizel's Carleton outdoor fixtures bring a handsome colonial appeal to your home. Trellis by Hinkley Lighting is a collection of traditional European-style lanterns designed in a Regency Bronze finish with dense clear seedy glass. Transitional lighting splits the difference. A good choice for nearly any location, these outdoor lights are a twist on traditional. Quoizel's Carson outdoor collection is a classic design that will maintain its beauty for many years. This clean design of Quoizel's Harmony Collection has minimal ornamentation and and pure lines, giving it a peaceful, Zen-like appeal. These fans are suitable for Installation: in wet or damp locations. Many have light kits. Competitively priced modern and contemporary outdoor lighting from Access. High Effficiency LED and other light sources. Black, Brushed Silver, Stainless Steel, Bronze or Satin Chrome finishes. This collection of outdoor lighting has unique gargoyle lanterns and more traditional lighting. They combine beautiful clear or mottled glass is combined with all brass components. Finishes such as Iron, Raw Copper or Siena Bronze fit beautifully with your home. All Framburg lighting fixtures are hand made in the U.S.A. The Rue Vieille Collection by Minka-Lavery is finished in a rich bronze with clear seedy glass. The look is very traditional drawing from historic elements for an affluent appearance. The collection includes wall lanterns in three sizes, a hanging lantern and a post light. Transglobe's Francisco, Parsons & Parkway Collections have curved glass panels have beveled edges. They are available in seven finishes. The standard sockets can use any standard base bulb, even the most energy efficient. Choose a high efficiency LED, Plumen or other Fluorescent or use a vintage reproduction bulb. Altogether, these traditional outdoor lights look much more expensive than they are and coordinate with many exteriors. The convenience and safety of motion sensor lights and the savings of dawn-to-dusk operation all in decorative lighting. Lighting for security and safety. These spotlights and floodlights are efficient lighting. Eurofase 23250 LED Energy Saving Floodlight is a real energy conserving powerful floodlight. Relamping once every 12-15 years, instead of every 6 months. Perfect for hard to service locations. Rugged die cast design ensures LEDs operate at optimum temperature for long life. Sealed to the environment for long reliable service life. An overview of brick lights, step lights, mini step lights, deck lights and wall lights from Hadco, Kichler, Hinkley and more. Bullets, flood lights, well lights and inground lighting, wall washers, haning lights, downlights and underwater lights from Hadco, Hinkley, Kichler and more. Low voltage and line voltage path lights and bollards from Hadco, Hinkley, Kichler and more. Spun copper fixtures are natural and will patina over time. Art Nouveau inspired collection of path lights reflect the organic, floral inspired motifs with their highly stylized, flowing curvilinear forms. Low Voltage, Line Voltage and LED landcape lighting, path lighting and deck lighting to coordinate with your Mission Style or Arts and Crafts Style. Hinkley's Atlantis unique modern contemporary outdoor lighting is available with LED or MR16 lamping. Choose from Black, White Titanium or Bronze finish. These angular lights make a definite statement. Made of extruded aluminum. Solid Brass with Copper Bronze finish with Clear Optic Glass or Cast Aluminum in Pearl Bronze finish with Inside Etched Amber Glass on a Pineapple Shaped Outdoor Fixture. Coordinates with the Plantation Indoors and Outdoors Collection. Saybrook's nautical-inspired design features a circular form of clear seedy glass bound by a floating center band fastened with cast knobs. The aluminum construction in a robust Oil Rubbed Bronze finish showcases the hand-applied highlights, adding a touch of British elegance and traditional detailing. This classic modern contemporary outdoor lighting collection has Clear Seedy glass with Black, Hematite or Buckeye Bronze finished solid aluminum fixtures. T-5 Wedge, fluorescent or LED lamping. Anastasia's playful elegance adds sophistication and charm to any exterior. This Outdoor Collection is available in Burnished Bronze, Textured Matte Black, Tawny Port or Walnut finish. Clear hammered glass is included with all finishes. Small and medium wall brackets, a wall pocket sconce, medium lantern and post lantern, all finished in Aged Bronze. 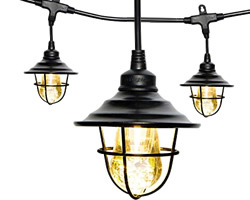 Aged Bronze finish brings out the style in the Belle Grove Outdoor Lighting collection. There are wall brackets in small, medium and large, a wall pocket sconce, medium hanging pendant and pier or post mounted light. Sophisticated New England styling gives Hartford its classic flair. Available in Antique Copper or Burnished Bronze finish with Clear Seeded glass. This transitional outdoor lighting is finished in Antique Copper. There is a small pendant and wall brackets in three sizes. This Collection is attractive enough to use anywhere inside your home, but the Aluminum Frame is robust enough to handle direct weather for outdoor use. The Tapered Clear Crackle Glass is a great option to feature vintage bulbs. These outdoor fixtures have Old Rust finish on a beautiful traditional collection of lighting. Pinecones, branches and tufts of straw make Ponderosa as individual as nature itself. The Ponderosa Outdoor Collection features Ponderosa finish with Marblized Glass. These Stainless Steel outdoor lights have the look of lanterns with candles. This Mid-Centuy Modern Collection is attractive enough to use anywhere inside your home, but the Aluminum Frame is robust enough to handle direct weather for outdoor use. The Clear Seeded Glass is a great option to feature vintage bulbs. The Shelby Collection is attractive enough to use anywhere inside Mid-Centuy Modern or Contemporary home, but the Aluminum Frame is robust enough to handle direct weather for outdoor use. The Clear Seeded Glass is a great option to feature vintage bulbs. The Trellis Collection was inspired by the lattice components that make garden trellises. Featuring Kalcos Stainless Steel finish, the woven metal shell is highlights by ribbons of hand-forged iron to add a touch of elegance. The candle-like lights are encased in Water Glass shades to create a flickering effect that is pleasing to the eye. Treat the exterior of your home with lighting worthy of the beauty and security your family deserves. This transitional style with clear, beveled glass fits into most any neighborhood and with most any architecture style. Quoizel's Newbury Traditional Outdoor Collection has wall, ceiling, post and hanging lanterns in sizes for every application. Choose from Small, Medium, Large and Extra Large sizes. The classic design and beveled glass of the Newbury gives the outside of your home a rich elegance, without making it look over-embellished. It's a versatile look that coordinates with most any architectural style. Beekman Place is one of New York Citys most sought-after residential addresses. A gracious ambiance that is elegant, but not too formal, impressive but not ostentatious. Georgian-style architecture dictates the façade, with handsome detail and a rich history. So it is with the latest Fine Art Lamps outdoor introduction  unequivocally elegant outdoor designs in weathered woodland brown with gold highlights and solid brass accents. Mission style outdoor series. Warm Bronze patina. Smooth finish is accented by striated champagne linen glass. Inspired by classic elements in mission design, Capistrano is a stylized and contemporary offering. Featuring a warm bronze patina and striated champagne linen glass, these pieces offer a clean architectural design while emitting a warm inviting glow. The smooth finish and clean lines are complemented by details such as the chain and bolt shapes that carry the design elements throughout the collection. Paneled iron outdoor lighting in variegated rich umber patina with gold accents and antiqued glass with vestiges of Celtic highlights. Textured seedy glass. Stylized quatrefoil design features Marbella wrought iron finish and subtle iridescent textured glass. 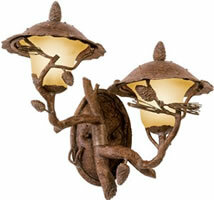 Outdoor Collection includes Wall Mounts, Pier Mounts, Flush Mounts and Lanterns. Invoking the soothing salty breezes of the Mediterranean and the rich design traditions of these historic coasts, this collection of outdoor lighting is an example of classical elegance, featuring stylized quatrefoil designs in Marbella wrought iron finish. Subtle iridescent textured glass adds another element of beauty to these pieces. A new concept in art-glass lighting! Fine Art Lamps glass department has developed a "bakehouse" for crystal. Fine Art Lamps glass makers use a five day process to hand create glass using crystal spires, crystal river stones and crystal colored shards, then baking and annealing them for several days at high temperatures to forms a massive block which is then carefully polished. Bubbles and seeds formed naturally in the slow bakehouse process, add to the dynamic effect when the slabs are illuminated by hidden fluorescent light, and the entire crystal composition comes to life. Available in silver, silver leaf and bronze finishes with four different looks  Crystal River Stones, Crystal Spires, Crystal Shards Blue: Cobalt & Aqua, and Crystal Shards Neutrals: Carnelian & Citrine. 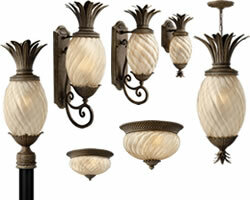 Outdoor lighting Collection in antiqued Bronze finish with subtle gold accents and acanthus leaf motif. Features textured seedy glass panes. The great patchwork-quilt area of Southeast England, part of the West Country, abounds in rolling hills, foreboding moors and picturesque villages that provide some of the finest scenery in England. Inspired by its history, each piece features forged bronze finish with antiqued gold accents and textured seedy glass. Built as a royal palace, the Louvre stands at the heart of Paris, housing the worlds greatest museum. In the days of Louis XIV, within the palace walls lived hundreds of artists and craftsmen, supplying the decorative needs of the court. The arcades of the Louvre, then as now, were lit by lanterns designed and made on site. Fine Art Lamps Louvre collection of outdoor lighting designs is inspired by the simple yet elegant lines of the lanterns that have adorned the arcades of the Louvre for centuries. In a fine bronze finish with clear blown glass, Louvre is a strong addition to many architectural styles. Singapore in the 30s was a vibrant crossroads of Eastern and Western cultures. This collection of hanging, ceiling and post fixtures features dark bronze patina finish with off-white interior glass surrounded by a clear, textured outer glass. Fine Art Lamps Warwickshire outdoor collection uses individually beveled, leaded glass panels set in a dramatic dark wrought iron patina. Most Fine Art Lamps products can be customized and may be converted to 220v. Brick Lights, Step Lights and Wall lights for every indoor and outdoor application. An overview of Step Lights & Wall Lights - LED, Xenon and other options, 12 volt and line voltage. Compare products, options and prices.